A three-point night earns Logan Couture PPOTN honours as the San Jose Sharks beat Nashville 5-0 in Game 7 of their Western Conference semifinal series. The centreman scored one goal and had two assists for the Sharks, who punched their ticket to West Final against St. Louis. STAT PACK: Couture had a team-high four shots on goal, blocked one shot, recorded one hit, and took 26 shifts in 15:40 of ice time. 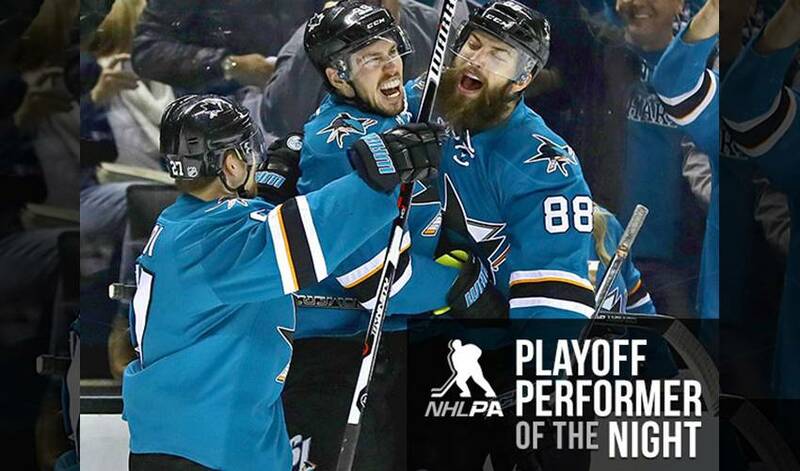 HOT COUTURE: “He (Logan Couture) was outstanding,” praised San Jose head coach Peter DeBoer. “He's just getting better. Everyone saw how much we missed him. To get him back now, he's fresh, obviously. He's feeling, I think, getting back to 100 per cent, and we're seeing it, the season he maybe could have had had he been healthy all year. He's an elite player." LEADER OF THE PACK: Couture leads all players with 7-10-17 during the 2016 Stanley Cup Playoffs (12 GP). TEAL PARTY: Couture posted 6-5-11 in the seven-game victory versus Nashville. That is a Sharks record for points in one postseason series, besting the mark set by Igor Larionov in the 1994 Western Conference Quarterfinals vs. Detroit (2-8-10 in 7 GP). MORE TO COME: Couture’s 17 playoff points also are one shy of Larionov’s single-year franchise record, established in 1994 (5-13-18 in 14 GP). HONOURABLE MENTIONS: Patrick Marleau and Joe Thornton each had a goal and an assist. Marc-Edouard Vlasic contributed two helpers. Martin Jones made 20 saves.